The first launch of a Proton-M carrier rocket after an abortive blast-off in May is expected to take place in a period from August 28 to 30, 2015, a source in the Russian space sector told TASS on Monday. "An Inmarsat-5F3 spacecraft may be launched in a period from August 28 to August 30. These are preliminary dates. The final schedule of launches will be endorsed by the Khrunichev Center [Proton manufacturer — TASS] within days," the source said. Earlier, Roscosmos chief Igor Komarov said that the first post-accident Proton launch was planned for August but did not proved exact dates. An accident at a Proton-M carrier rocket that was to put into orbit a Mexican satellite took place on May 16, exactly a year after a similar accident. Roscosmos specialists arrived at a conclusion that the cause of the accident was a design fault, like the one that was behind a Proton fall back in 1988. 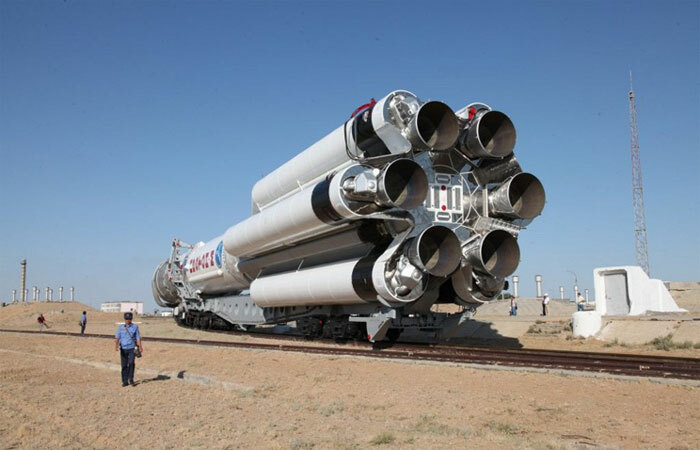 Preparations for launches of the Proton-M carrier rocket resume at the Baikonur spaceport in Kazakhstan after temporary suspension after the crash in May. "The next launch is planned to be made with British communications satellite Inmarsat 5 F3. In accordance with the new schedule of launches, the next launch is scheduled for August 28," Khrunichev Center communications department said on Wednesday. Proton launches were temporarily suspended after the Proton-M carrier rocket with the Briz-M acceleration unit and Mexica’s Mexsat-1 satellite crashed on May 16. A minute before the Briz-M acceleration unit with the Mexican satellite was expected to separate from the carrier rocket, an emergency situation occurred at an altitude of 161 km, due to which the rocket’s head section and third stage failed to separate and burnt up in the dense layers of the Earth’s atmosphere above the Trans-Baikal area in East Siberia. Roscosmos space agency said the crash occurred because of an old deficiency in the construction of engines. Russian Deputy Prime Minister Dmitry Rogozin said the recent accident "is miraculously similar" to the crashes in 1988 and 2014, when the state commission also failed to establish the exact causes for malfunctions. Roscosmos head Igor Komarov ordered the Khrunichev Center to develop and implement a plan on eliminating deficiency in the construction and design of engines.